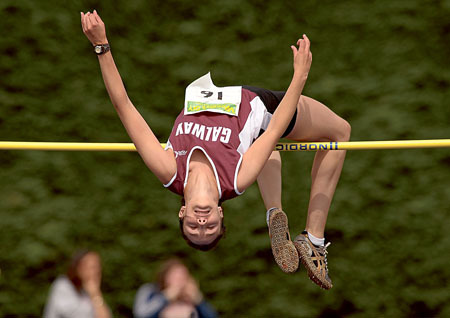 Galway’s Cathriona Farrell who jumped 1.70m to finish second behind Irish record holder Deirdre Ryan at the National Track & Field championships. Galwegian Gary Thornton is hoping to follow sprinter Paul Hession's footsteps with qualification for the London Olympics. Hession guaranteed his participation in the Olympics with a qualification time of 20.51 at the National Track & Field championships in Santry recently, while Thornton, despite little competition this year, also has a realistic chance of gaining an Olympic qualification time for London 2012. Thornton competed in the 10k event and showed good pace by finishing second behind Clonliffe’s Mark Kenneally in 29:39. The current Irish marathon qualification A-standard time is 2:15 and it is likely Thornton will be targeting an autumn marathon. The other significant result for Galway in the national championships came from GCH thrower Sean Breathnach, who won the shot putt with a 16.24 throw. In their second season fielding a club team in the national senior men's track and field league Galway City Harriers finished second in the division one final in Tullamore on Saturday. Like the 2010 Galway ladies team, they will be promoted to the premier division for next year. First points on the track were collected by Ireland schools' winner Anthony Hebron who took fourth in the 110 hurdles and second in the 400m event. Sprinter Daragh Whyte, with two years left at school, posted a PB of 23.04 in the 200m for a respectable fifth. Ronan Kelly, also with two more years at school, produced another second place in the 400m. He was joined in the sprint relay team by Whyte, Hebron and Sean Kyne, finishing a solid fifth place. Keith Fallon produced a PB and passed the landmark of a sub four minutes in the 1500m, finishing fourth behind three established seniors, only losing touch slightly at the start of the final lap. Fallon travels to England on Tuesday for the BMC 800m in Manchester along with GCH team mate Eddie Costello, who has just returned to racing from injury. On Saturday he finished just outside two minutes, but in a respectable fourth place. Igor Munten, competing for the first time this season, won not only the high jump, but produced a surprise second place finish in the unfamiliar event of the triple jump. On the track Alan Kelly also took part in the steeplechase, picking up a valuable six points. Sean Breathnach has been the biggest GCH points scorer all season. A regular member of Irish international teams, he has consistently produced winning performances in the throwing events. Due to an incorrectly completed entry form, Breathnach threw the javelin rather the discus or shot, but threw nearly 50m to win the competition. He followed that up with a convincing win in the 56 lb weight throw, clearing 8.18m. Matt Bidwell was up against the cream of Irish distance runners as the division one and premier league fields were combined, but he made use of the pace set by Mark Keneally to take him clear of everyone in the division one match, finishing second in 15m 26 behind Sean Connolly. Fallon replaced White in an otherwise unchanged team for the 4x100m, and produced one of the highlights of the day with a superb win. The Galway women’s team of Jane Lydon, Tara Hession, Linda Porter, Caroline Whirskey, Laura Shaughnessy, Sarah Finnegan, Rachel Finnegan, Maeve Curley, Cathriona Farrell, Ashley McDonnell, Mary Barrett, Melissa Barrett and Nicola Monaghan competed against the best in the country in the premier league. The best finishes were from Maeve Curley, who dominated the 1500m walk in a time of 6:50, and Cathriona Farrell who jumped 1.70 behind Irish record holder Deirdre Ryan. Elsewhere Craughwell AC Athletes Gerry Ryan and Peter O'Sullivan both successfully defended their national titles at the Woodies National Masters Championships in Tullamore on Sunday. O'Sullivan won the M35 1500m by more than 10 seconds, finishing in 4:18. Even though he is in the second half of his age category, Ryan's victory was never going to be in doubt in the M45 5000m. The 2011 Streets of Galway champion won the race outright, beating not only the M45s, but also the M40s and M35s by a considerable margin.